Having a voucher means you are having a document with some monetary aspect. It’s like a receipt or bill on which transactions are based. There are several forms of voucher like cash voucher; discount voucher, gift vouchers or travel voucher, each of the type is associated with the monetary use. On a valid voucher a serial number, date, issuer and recipient names are generally mentioned. A simple paper voucher has these elements on it but nowadays vouchers are being designed on colorful papers with exotic formats to attract the customers. These vouchers complement the style of other documents printed by the same company like having a logo or brand in the same color as integrated on the cash receipt or invoices. All the transactions are written in a single voucher precisely. If it is a payment voucher then the amount which has been paid is written on the voucher and like for gift voucher the limit of the money to buy the gift is mentioned on the voucher or sometimes percentage discount is mentioned on the voucher relative to the cost price of the item. If you want to design a voucher for your company you can use free online voucher templates, they are pre- formatted and are offered in every voucher category with fully customizable options. 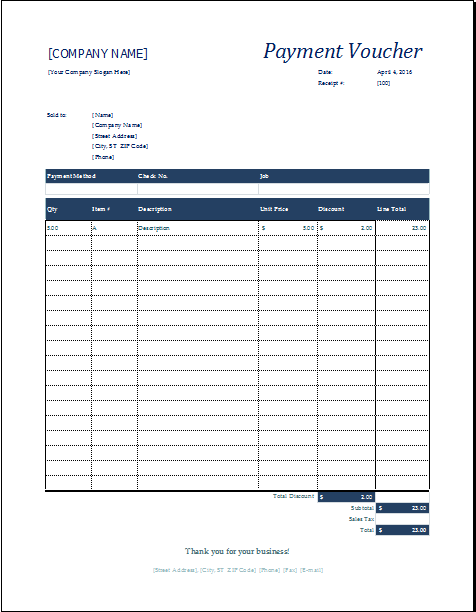 These templates are easily downloaded to your computer and can be edited to fill in your amounts and details. You can print as many copies of vouchers through the print option present on these templates.